Not sure where to start? Start with an Intro Lesson. This is your foundation for becoming a kiteboarder. 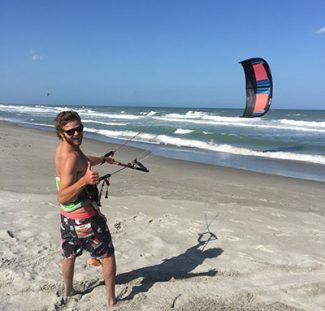 Learning to fly the kite is an essential part of kiteboarding. Don’t be fooled by discounted “Group Ground Courses”. This is a private lesson to make sure (and your friends if you desire) get the attention you need to learn the essentials. This lesson can be done on land or in shallow water (condition dependent). It is very important to learn proper kite skills before adding the element of the board. The majority of this lesson is spent learning relevant kite flying skills with a full-size inflatable kiteboarding kite. All lessons are booked private unless you bring a partner(s). $20 deposit required upon booking. Buy it for yourself or a Gift Certificate HERE!